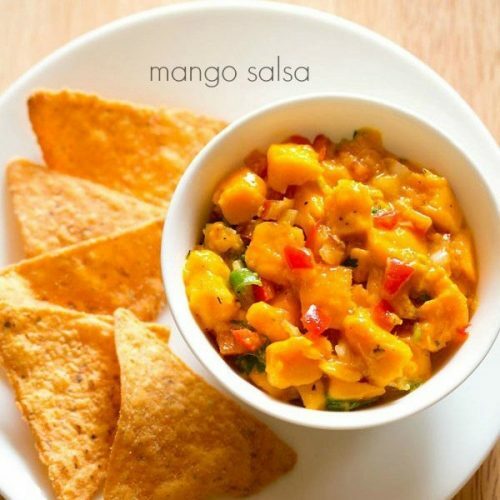 mango salsa recipe - spicy, sweet and tangy mango salsa made with ripe mangoes, red bell pepper, onions and spices. chop 1 large mango. you should be able to get 3/4 to 1 cup chopped mangoes. do use ripe and sweet mangoes. you can use any variety. finely chop 1 onion and 1 small capsicum. also chop 1 green chilli and 2 to 3 tablespoons coriander leaves. add the chopped mango in a mixing bowl. to the same bowl, add 1/4 cup finely chopped onion, 1/4 cup finely chopped red bell pepper (red capsicum), 1 green chili (chopped) and 2 to 3 tablespoons chopped coriander leaves. add the following spices - 1/2 teaspoon crushed black pepper, 1/4 teaspoon cumin powder, 1/8 teaspoon red chili powder or cayenne pepper. now add 2 teaspoons lemon juice. you can add more lemon juice if you want. lastly season with salt. here i used rock salt. you can also use black salt or regular salt. mix everything very well. check the taste. if the salsa is not spicy, then you can add some more green chilies. if the too spicy, then add some more mangoes. serve mango salsa plain or with some chips, crackers or tacos. spices can be adjusted as per your taste preferences. refrigerates well for 1 to 2 days.